We’re in that time of year where the typical summertime activities have come to an end. School is back in session, routines are in place and vacations are over. However…we’re a month away from the first day of fall, and I can’t even think about wearing a blanket scarf or a pair of boots. I’m still fanning myself and reaching for an iced coffee. Here in South Carolina we’ll be in the 80’s and 90’s well into September! When you combine back-to-school with summer temperatures, it means you need quick supper recipes that don’t overheat the kitchen. I was inspired by this recipe for a Chicken Enchilada Bake using Greek yogurt and decided to work the yogurt into one of my favorite weeknight recipes. It was a total success! The Greek yogurt made it so creamy and delicious that my Ranch loving husband ate two helpings without adding one drop of Ranch dressing! As a bonus, the whole dish takes minutes to assemble and only needs 15 minutes in the oven. Your late summer supper struggles are over! Well, at least for one night. Lightly spray a 9 inch pie plate with nonstick cooking spray and set aside. In a medium bowl, mix first six ingredients. Lay one tortilla in the bottom of the pie plate, then layer half of the chicken mixture. Add half of the cheese. Repeat the process, ending with a layer of cheese. Bake at 375 degrees for 15-20 minutes until cheese is melted and the dish is heated through. 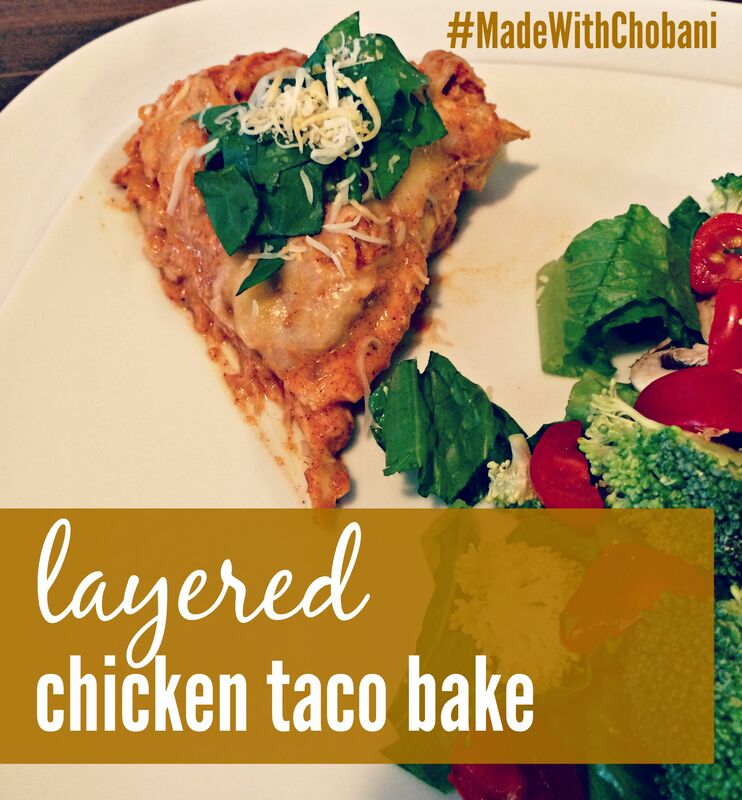 Serve with shredded lettuce, chopped tomatoes, avocado or salsa! This looks delicious and sounds easy to make! Thanks for sharing your recipe! You should definitely try it – I hope you enjoy it! Well who would not like that??? I don’t know! 🙂 Paul’s pretty picky so any recipe he’ll eat is a definite crowd-pleaser.